We went on a brief jaunt to Vermont this past weekend. Vermont is land of vintage VW’s it seems. We saw many VW beetles and buses. Now I know where they have all gone! I kept thinking that this mountainous land known for heavy snow should have vintage Jeeps though and finally they appeared. We were driving down rte 87 from Burlington and I decided to drop off onto the smaller road, rte 2. As soon as we pulled onto rte 2 I saw this Jeep. 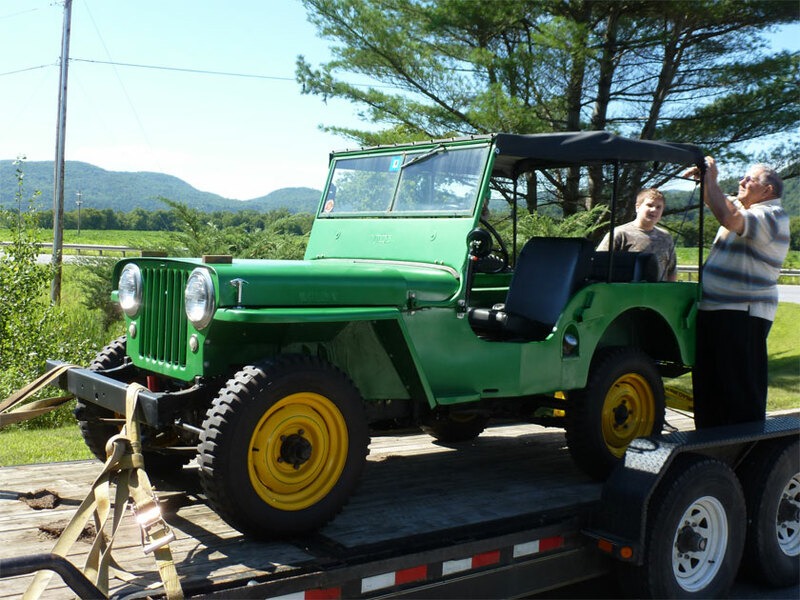 The Gadne family had just picked this 1948 CJ2A up and were taking it home. Apparently they owned a CJ3A in the 1970s but the rust killed it. Now they are looking for a CJ3B as well. I knew we were on the right road at this point. We continued down rte 2 to a very New England flea market in an old mill. Finding neat things we went back a town to find an ATM and this pulled in! A nice young fellow named Will owned this truck. It is a 1962 Willys on an S-10 chassis. Will said he wanted one as a kid and when this truck popped up he bought it. 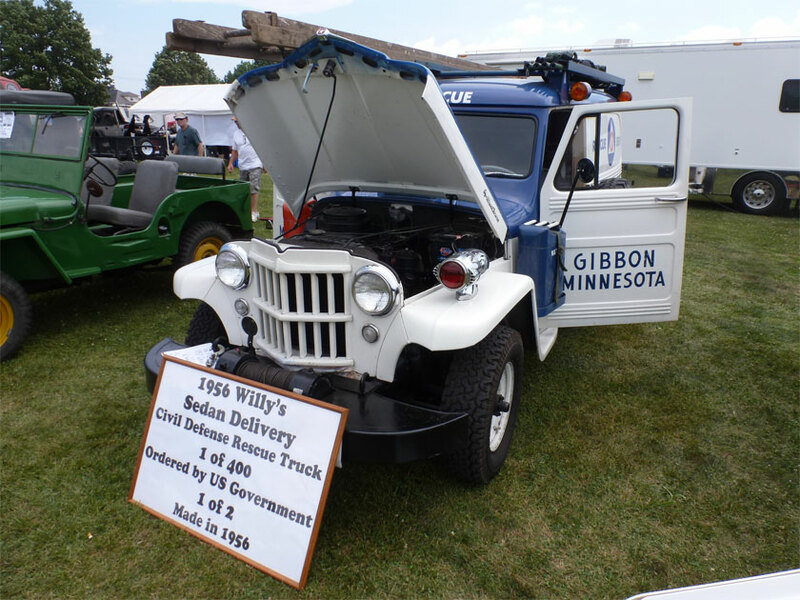 I really enjoyed these two Willys surprises and chatting with their owners. One our way out of Vermont we drove by this Fairmont Hy-Rail on rte 7. I can see it has popped up online before. Fairmont often worked with Willys so I am wondering if this has a Willys drivetrain? Does anyone know more about this model? Hy-Rails were designed to ride on railroad tracks. This one is missing its drop down railroad wheels. 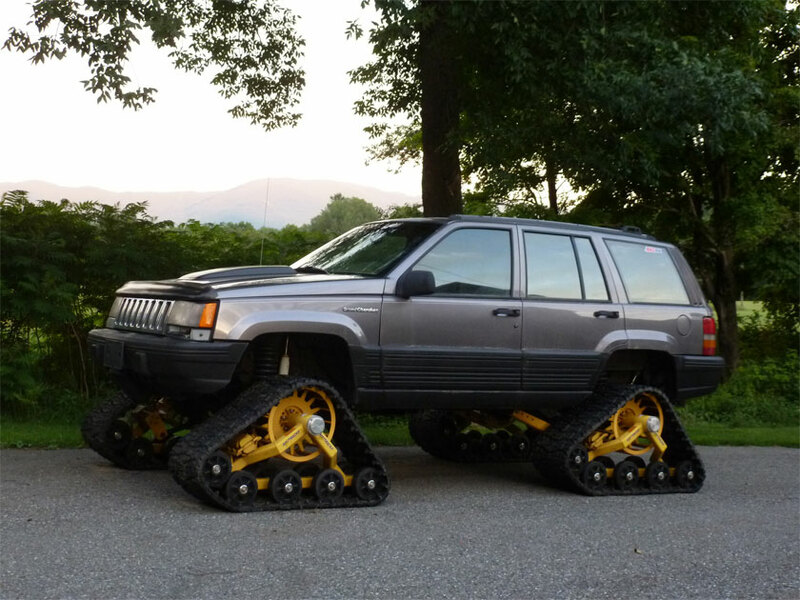 And finally for laughs is a newer Jeep conversion we saw near Mt. Mansfield in Stowe Vermont. 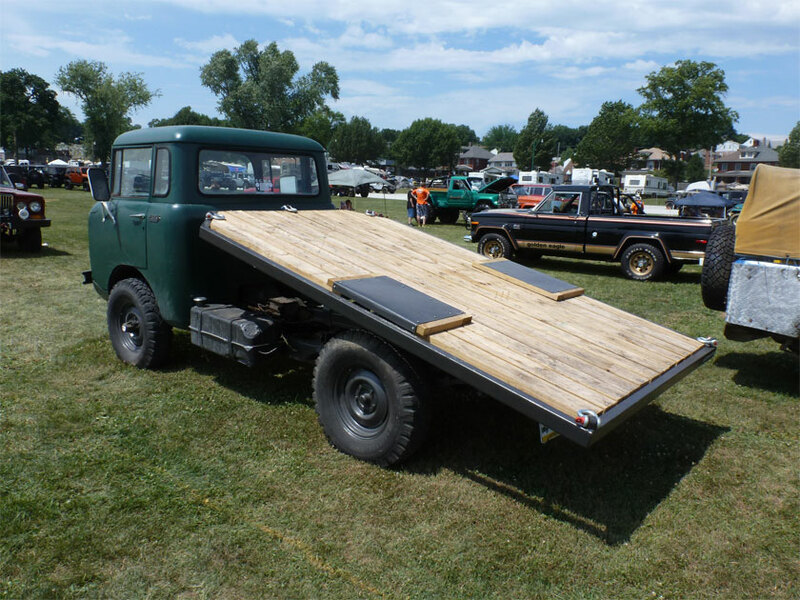 Could we do this to a vintage Willys? This past Saturday I drove the 1941 Willys MB to the 18th annual All Breeds Jeep Show in York, PA. the show is sponsored by PA Jeeps. This is largely a celebration of customized off road Jeeps but there are a few vintage gems scattered about. 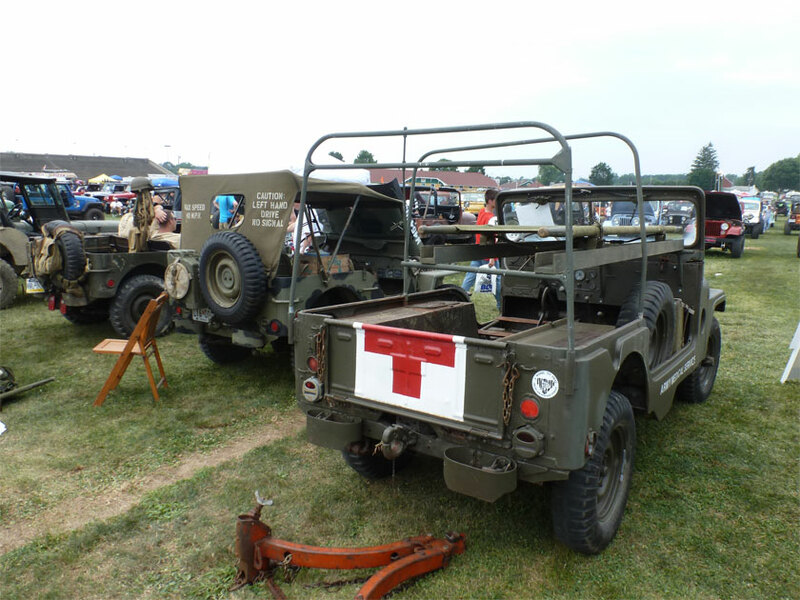 First thing I did was pull into the short row of original military Jeeps. Jeremy, owner of the early 1942 GPW, and his co-pilot Patrick were ecstatic to see another WW2 Jeep show up. 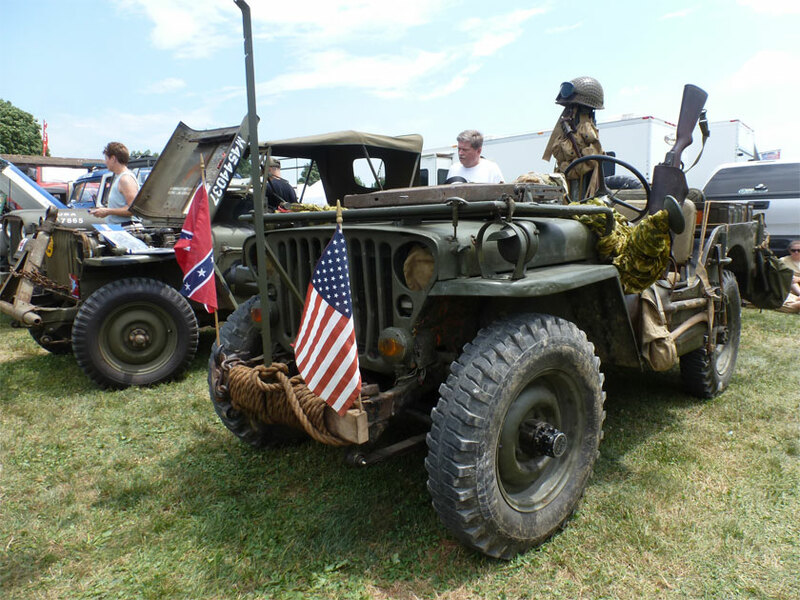 We had a great time talking WW2 Jeeps and seeing who knew who in the Jeep network. I loved the well used appearance of their GPW. Jeremy and Patrick even took their GPW on the off road course (doing some damage to their exhaust). A short while later the ambulance pulled in. 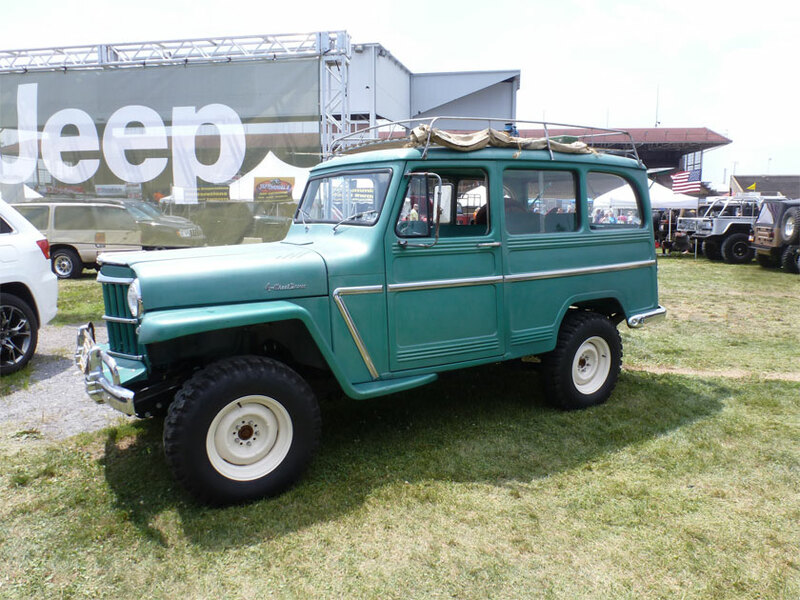 After a bit I set to wandering the show to see what other vintage Jeeps were in attendance. 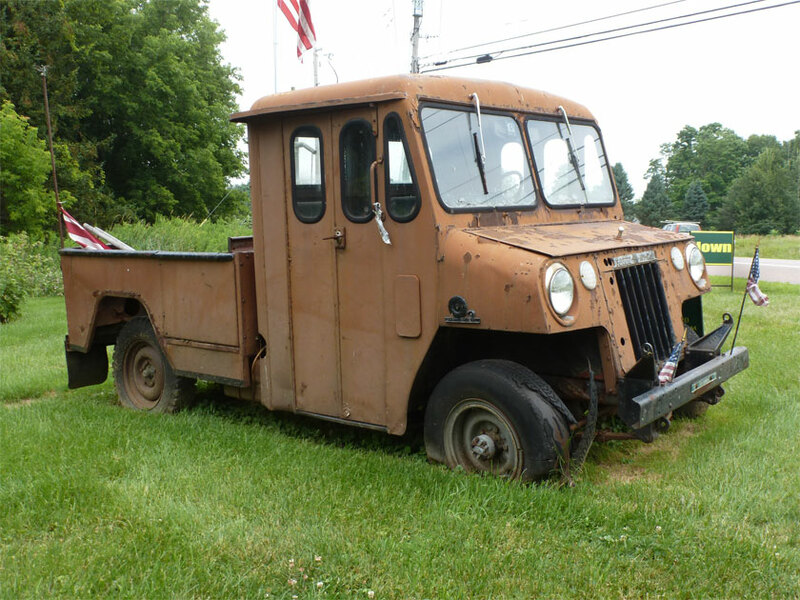 If you had $350 you could purchase this CJ2A body set. I wish I had a frame to drop this on. A short bit down the aisle from this project was a running chassis that this would have fit nicely on. 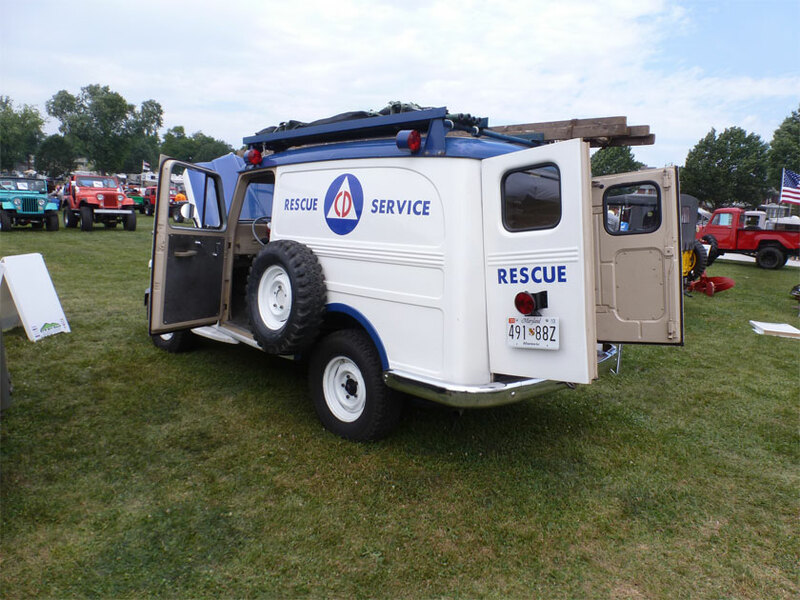 In the vintage Jeeps row was this beautiful 1956 Civil Defense wagon. I have seen it at another show as well. It is in wonderful condition and equipped quite well. In the Chrysler Jeep display was this project. 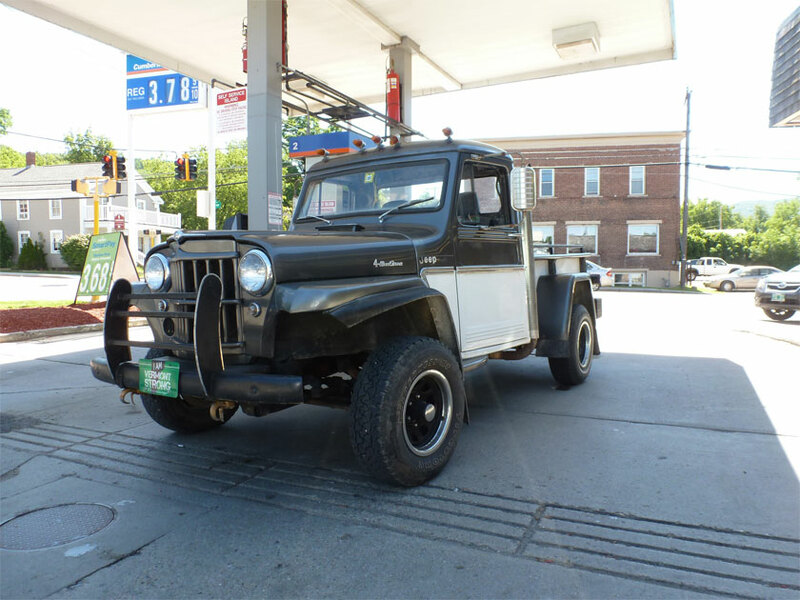 It is a 1962 Willys wagon mated to a 2004 Jeep chassis. The wagon was literally taken out of the Jeep archives where it had sat since new. This makes for a practical vintage style vehicle. Kyle of the East Coast Willys Association (join the association please!!) brought his nice FC with a dump bed, and his M38. I love the FCs and Kyle’s seemed the sole representative at the show. I also enjoyed finally meeting Kyle. 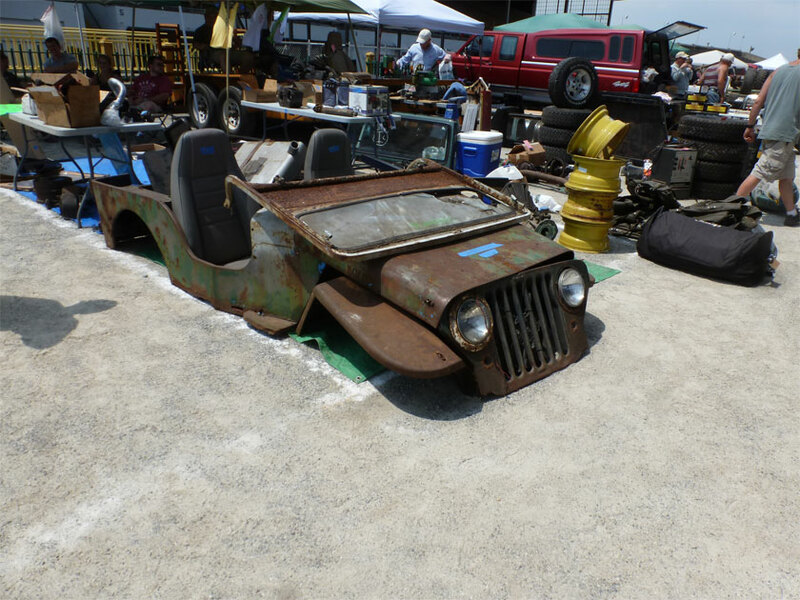 He is putting a great effort into creating a club for pre 1970 Jeep owners. 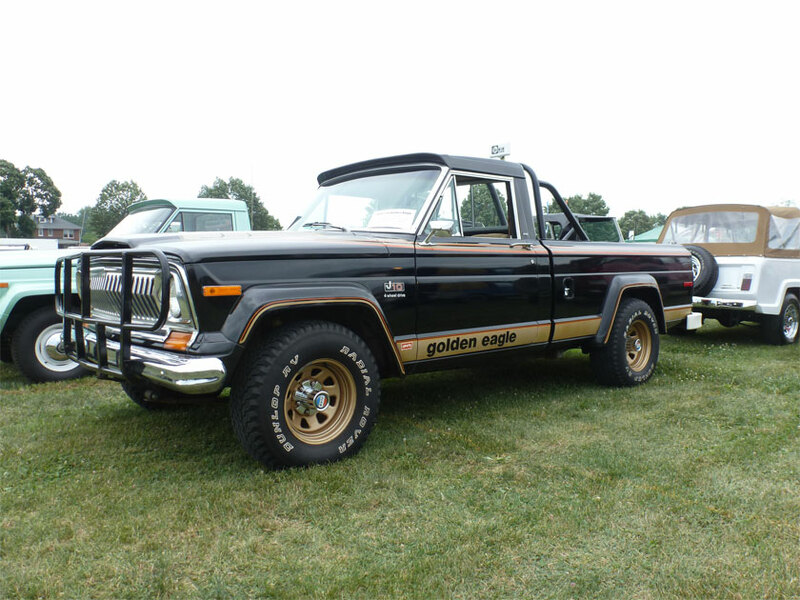 The final Jeep that really stood out to me was this Jeep Golden Eagle pickup. This was a low mileage all original example with a Levi’s denim interior. 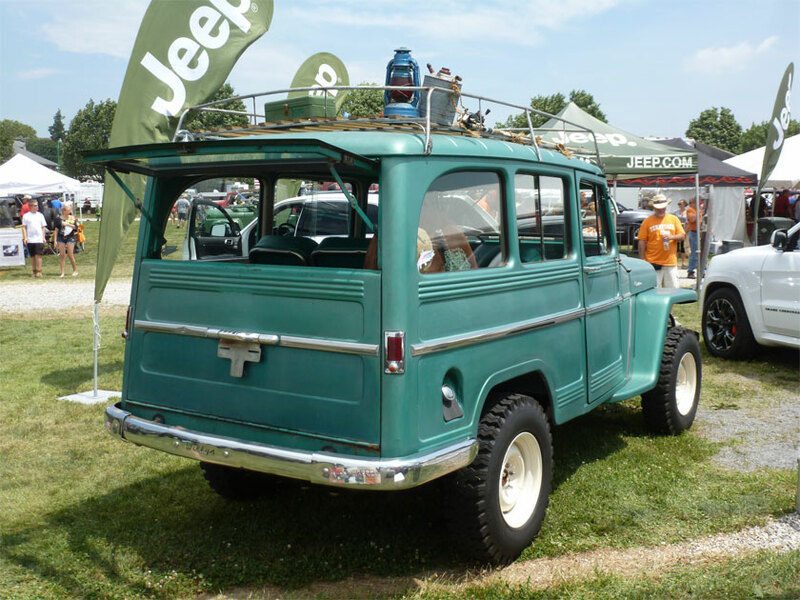 It stood out to me because my grandfather had a Jeep Honcho with a Levi’s interior. 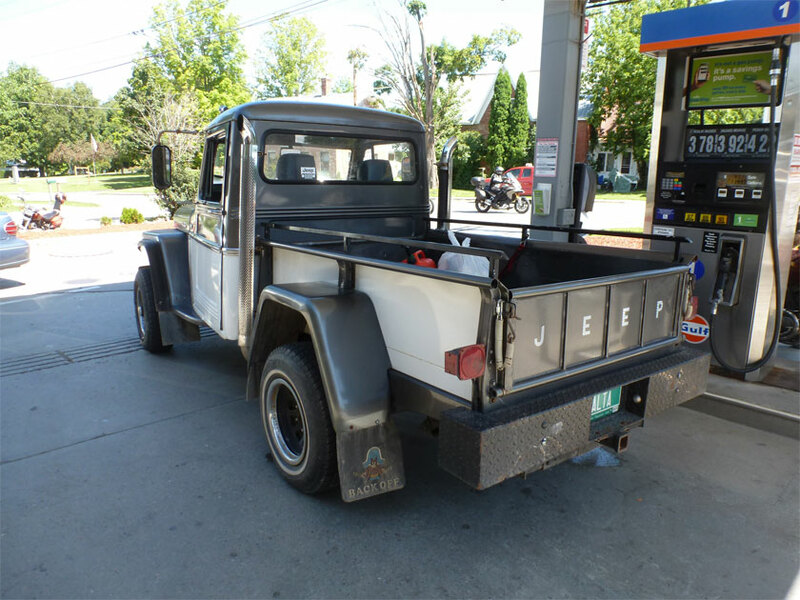 I grew up with that truck traveling around New Hampshire. It had only around 33,000 miles and was amazingly rust free when we sold it back to the very ungrateful original owners. Yep, that is one that my Dad and I kick ourselves over. 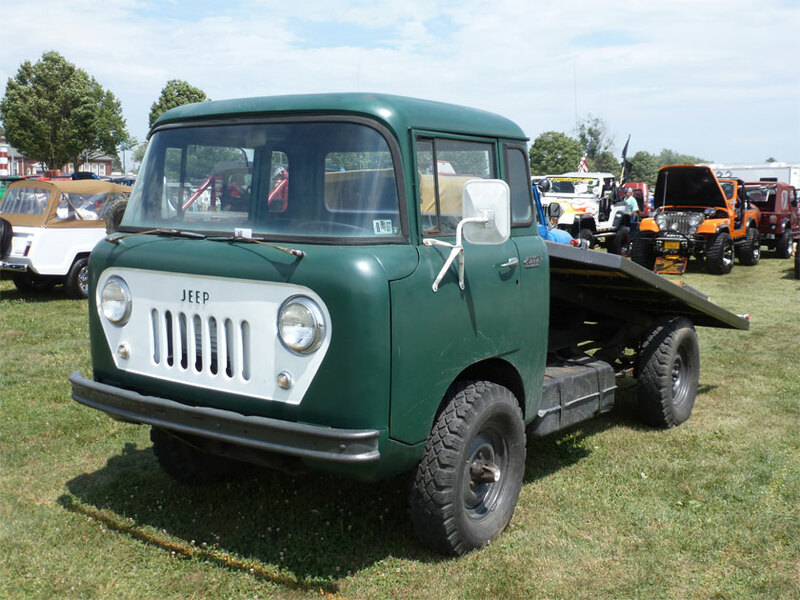 If you did not make it to the All Breeds Jeep Show I can recommend a truly vintage flat fender show coming up October 27th here in Westminster. Visit Jeepchasm for more information. 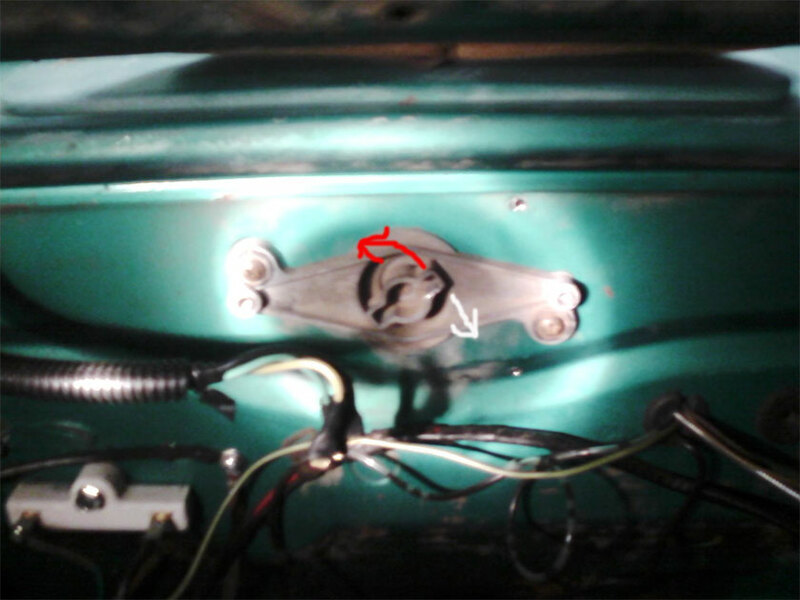 Willys pickup wiper conversion issue… HELP!!! So I need help. My mechanic and I feel like we are missing something blindingly obvious. 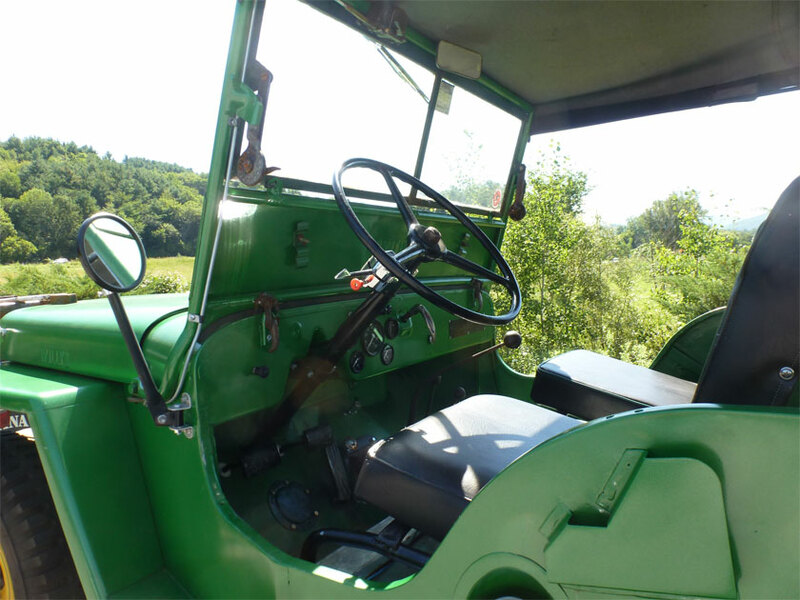 We are almost done with a 1961 Willys pickup for Great Frogs Winery in Annapolis Maryland. The only thing holding us up is the wipers…. Here is the issue in pictures. I would add video but that is pointless since….drumroll please…. you guessed it, they don’t work! Anyone who can help please email me or put a comment on this post. 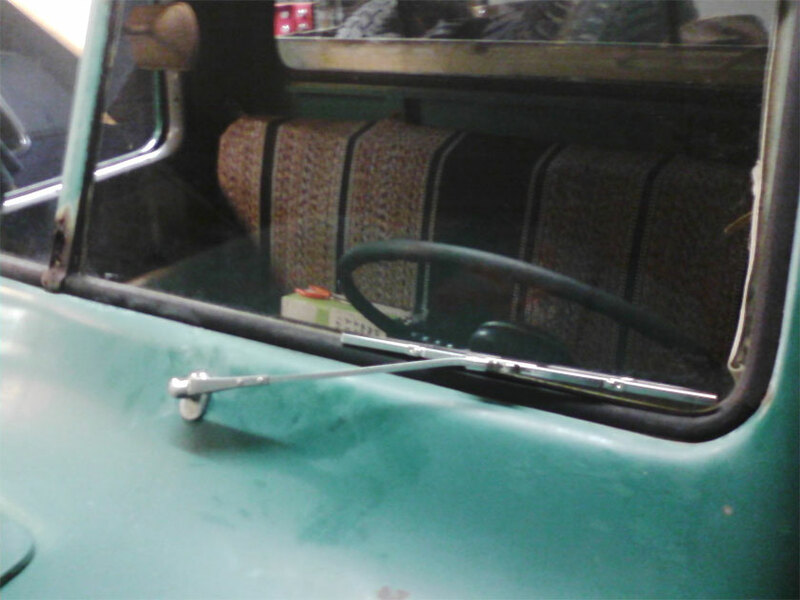 First off a view of the wiper assembly on the firewall. Now the windshield wipers are properly parked. The cables inside are all running parallel to each other. The white arrow shows the direction the electric motor is trying to turn the wipers. 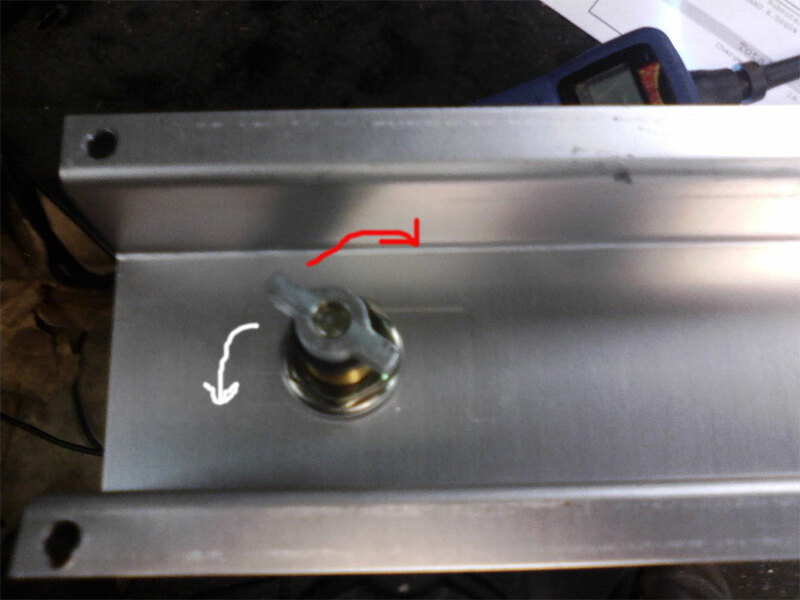 The red arrow is the direction the mechanism needs to turn in order for the wipers to move. They cannot budge in the direction the motor is trying to push them (white arrow remember please). And here is the back of the adaptor motor. As you can see it will fit nicely into the wiper mechanism. The white again is the direction the motor is trying to turn, the red is the direction the mechanism in the truck wants to turn for the wipers to move. And yes, the wipers are parked. I may be a total idiot and be doing something blindingly stupid… if so let me know. PLEASE! I am not a genius, just a Swede with wrenches and a love of Jeeps. I was just hoping that the company that seems to have the experience and know how with these vehicles could advise me. But since they will not hopefully one of you readers out there can help. UPDATE: Finally got a call, a whole shipment of electric motors was manufactured wrong. For expediency we are going with a rebuilt vacuum motor now. 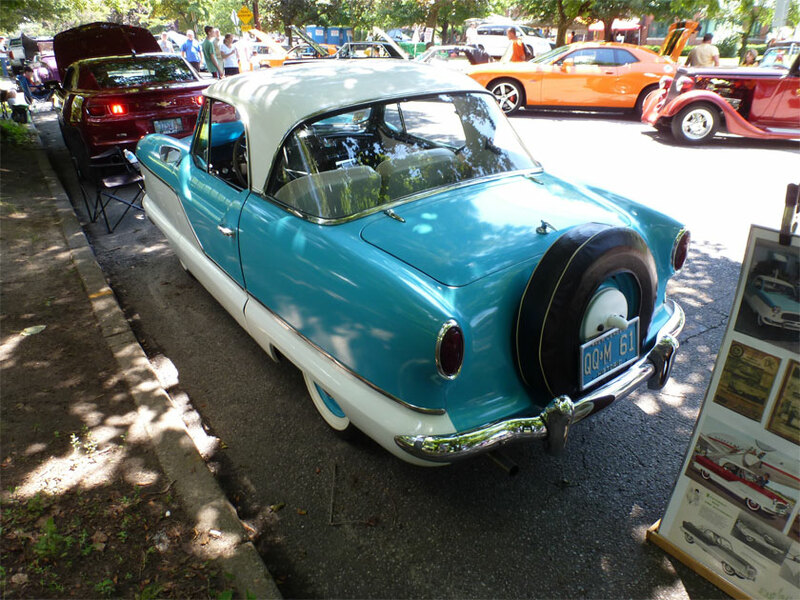 This will be my last post on the Merchantville, NJ carshow. In here I have collected some of my absolute favorite cars from the show. There were many musclecars and I have owned a couple in the past. But we see musclecars at every show nowadays. So I picked out the cars that stood out to me for their beauty and style. 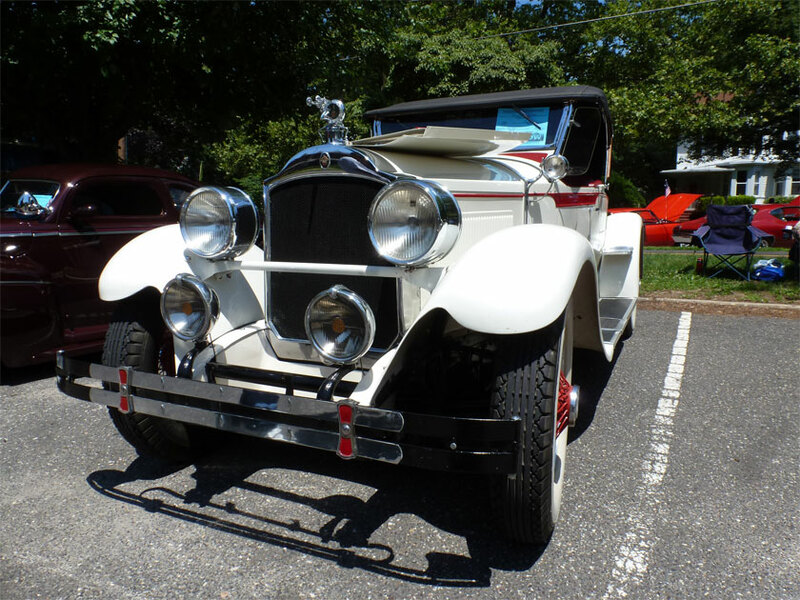 The first one that really stood out to me was this 1928 Packard. 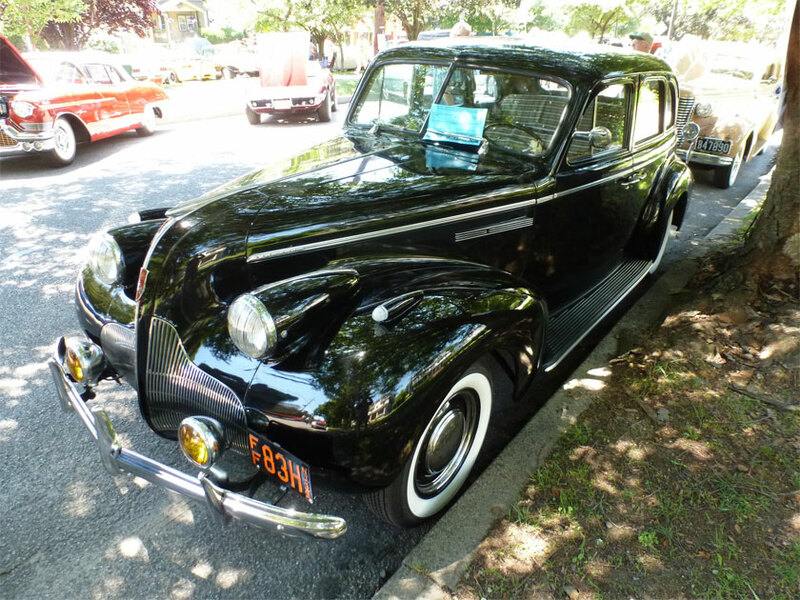 Packards were stylish and well built cars. Their slogan became,” ask the man who owns one.” My grandfather was quite a fan of them and finally bought a new one in the late 1940s. He also used to tell a story about dismantling a fellow MIT students Packard when he was in college. They dismantled the car and rebuilt it in his room while the fellow was away for a few days. Must have been a big room! 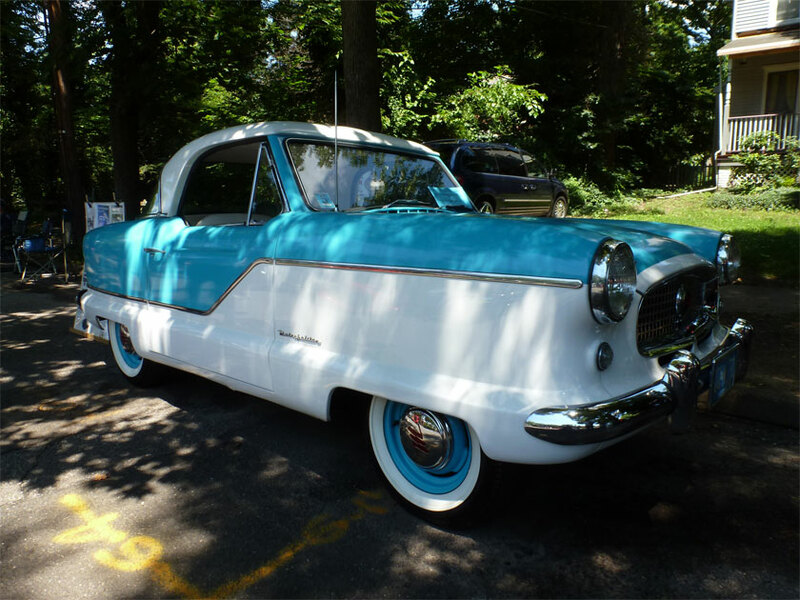 This 1961 Nash Metropolitan took me back to the 1955 Hudson Metropolitan I restored (and electrified!) with my students back in 2009. See that restoration and more about Metropolitans here: Met EV Nash merged with Hudson in the mid 1950s. 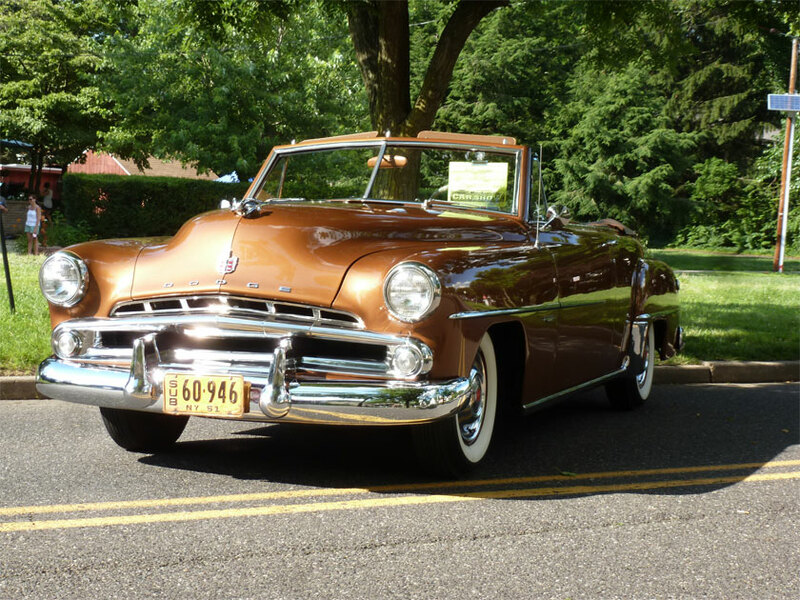 After 1955 Hudson’s name disappeared from Metropolitans and they were just made by Nash. Nash did much research after WW2 in order to build a small car. 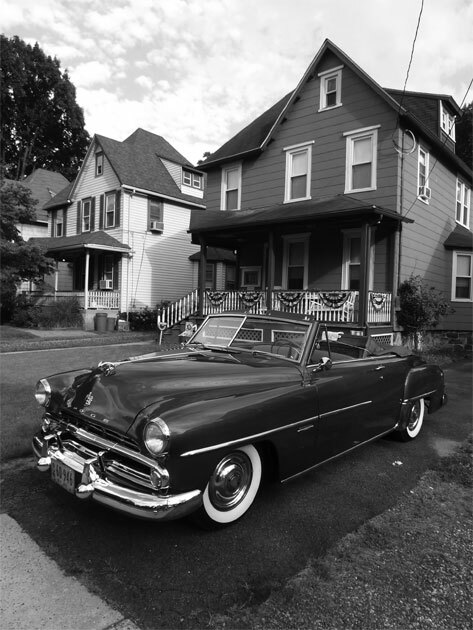 The car was designed as a second car for families but became popular as an inexpensive first automobile. Even though they were american, they were actually built in England due to less expensive tooling and labor. 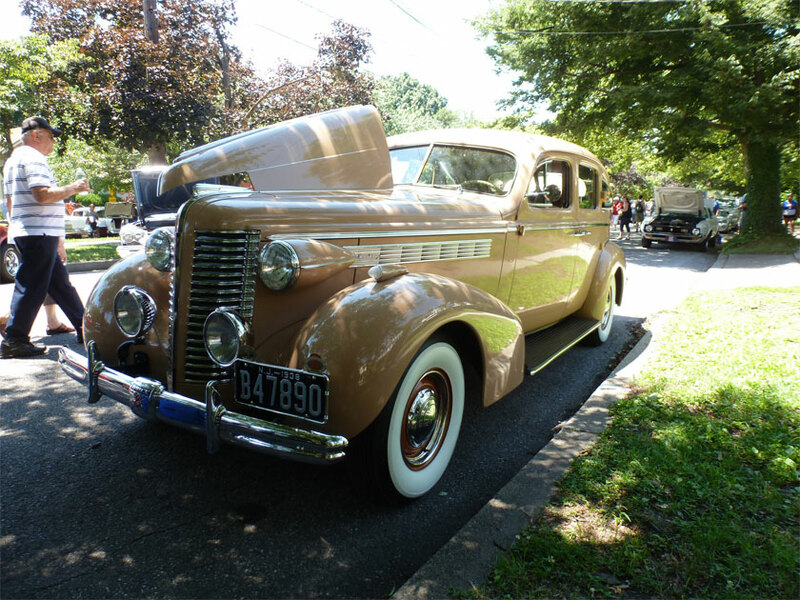 This pair of 1939 (black) and 1938 (beige) Buicks caught my eye. There were not that many representatives of the art deco era at the show. This last car was a 1951 (I think) Dodge brought by our friend Alex. Years ago I sold him a 1946 Plymouth. Alex has a real passion for these cars and he has instilled that passion in his young son, Eric. Alex bought a 1920s radio from our friend Scott. I though the loaded Dodge would make a great vintage photo so I converted it into black and white below. 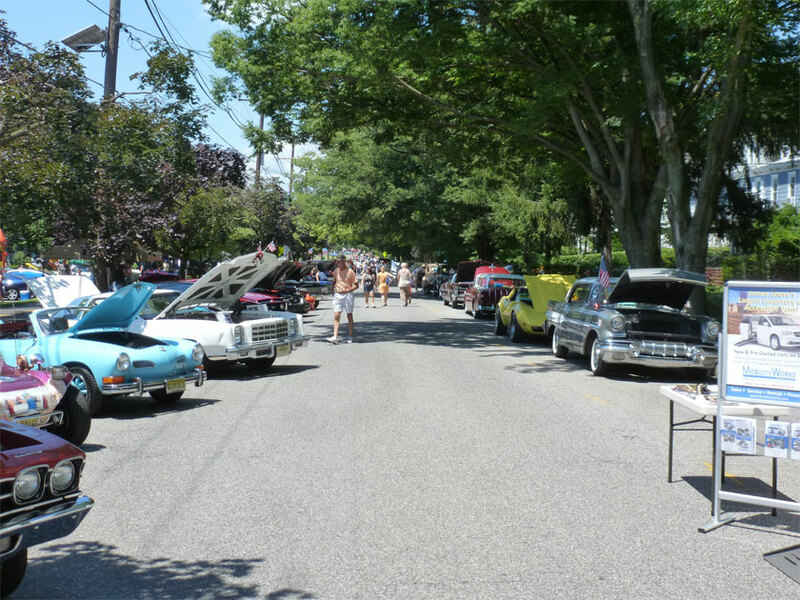 As you can see, Merchantville puts on quite a car show. Attend next year if you have the chance. 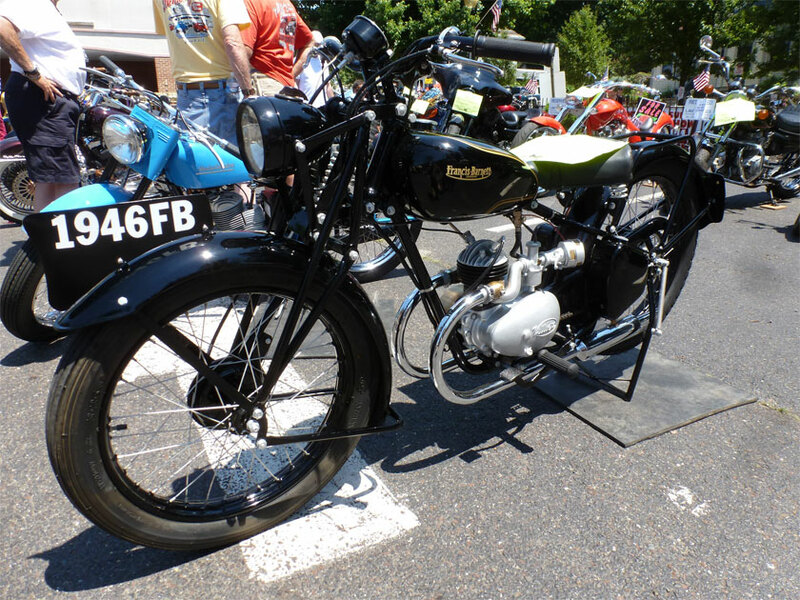 Another neat item we saw at Merchantville was a 1946 Francis barnett Merlin L.51. I have owned a 1948 one of these since around 2000. Mine is painted military green to match my Jeep. 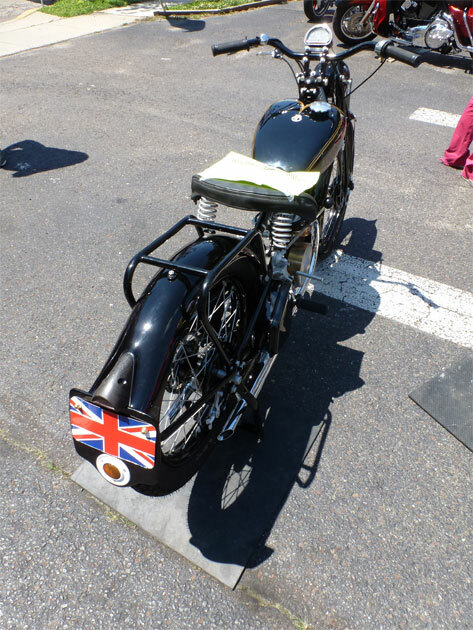 When I first bought this motorcycle I thought it was a British James motorcycle. Over a couple years of working on it I found that no James parts would fit. I spoke with a member of the Two stroke motorcycle club in England and he ran the numbers for me. I was quite surprised when he told me,” Merlin, by some strange coincidence you own a 1948 Francis Barnett Merlin L.51.” He also told me it was the 11th known in North America. Since I built my website many folks from around the world with Merlins have contacted me. They usually find them as basket cases and then rebuild them out of curiosity. The one at Merchantville, owned by a fellow named George Hirn, was the first I have seen in person other than mine. George’s Merlin makes number 17 that I know of in North America now. 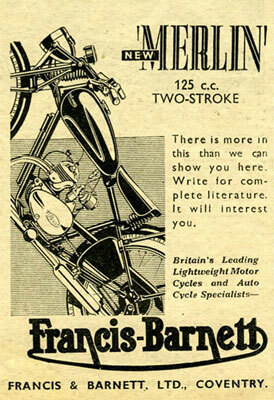 The Francis Barnett company manufactured Merlins into the early 1950s. 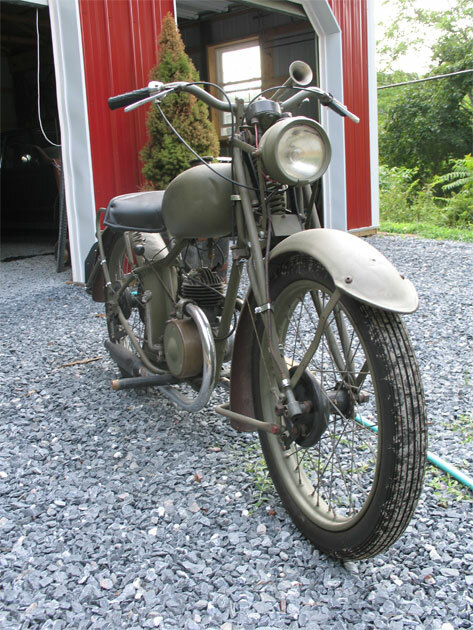 They were very similar to a pre WW2 motorcycle they made called the “Snipe”. 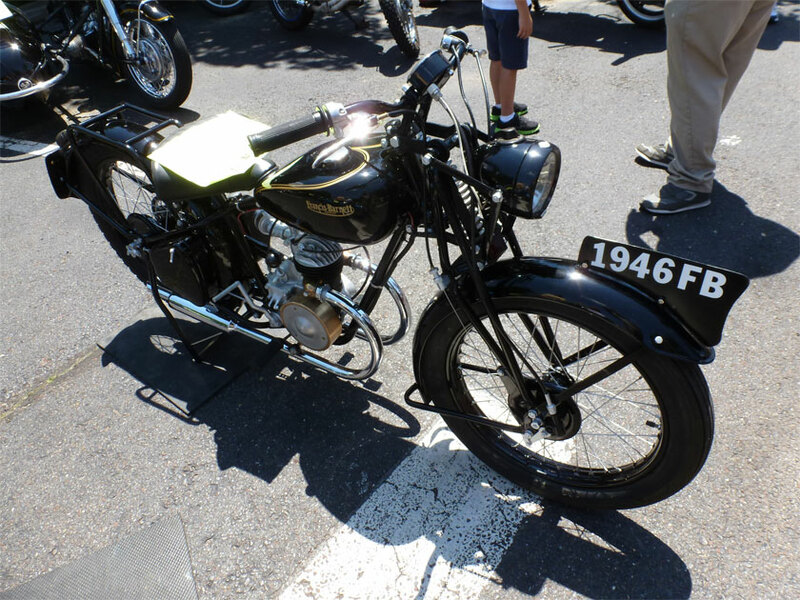 These motorcycles were perfect in a postwar Britain with gas rationing in effect. One of these lightweights could achieve 125 miles per gallon. As I have tracked Merlins in North America I have discovered that most were distributed by a dealership in Toronto. I know of one sitting in a basement in Toronto that I still would like to purchase. Since the motorcycles were small and inexpensive many were thrown away. Those that do appear are literally in baskets and boxes most of the time. 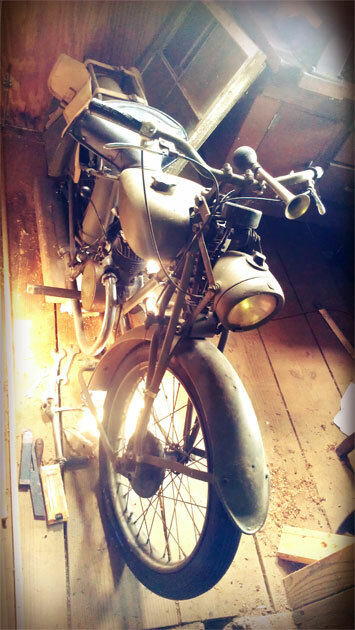 Despite their rarity they have some standard parts like a Villiers 125 cc engine and a Smith speedo. There is a company in England, Villiers Services that you can obtain many parts from. Greg’s 1946 Merlin inspired me. I need to work on getting mine back on the road….. and perhaps repaint it that beautiful black with gold pinstriping!! 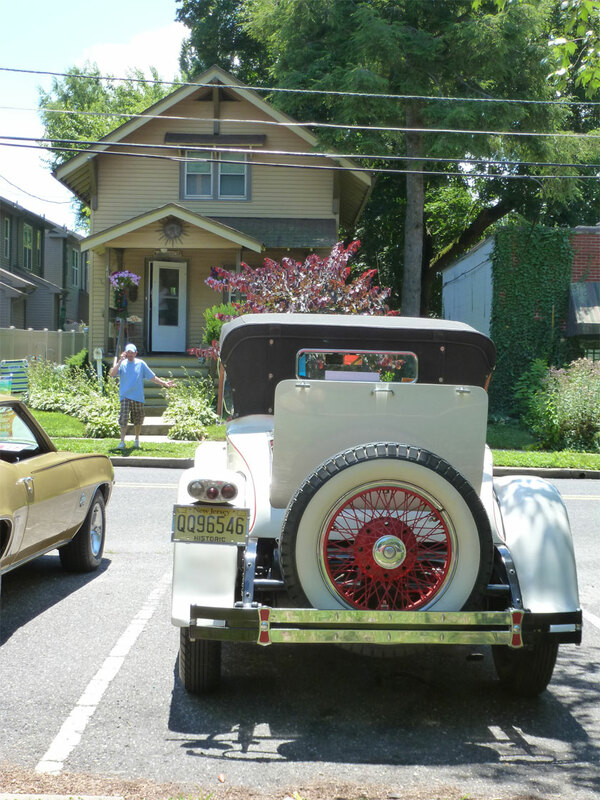 This past weekend we drove a bit North to Merchantville, NJ. Our friends Scott and Donna live there in a beautiful victorian house. Once a year the town shuts down for a day and hosts a whole town carshow. I will write a few different posts about what we saw at the show. There were many many many 1960s musclecars so I set out to find different vehicles that stood out. 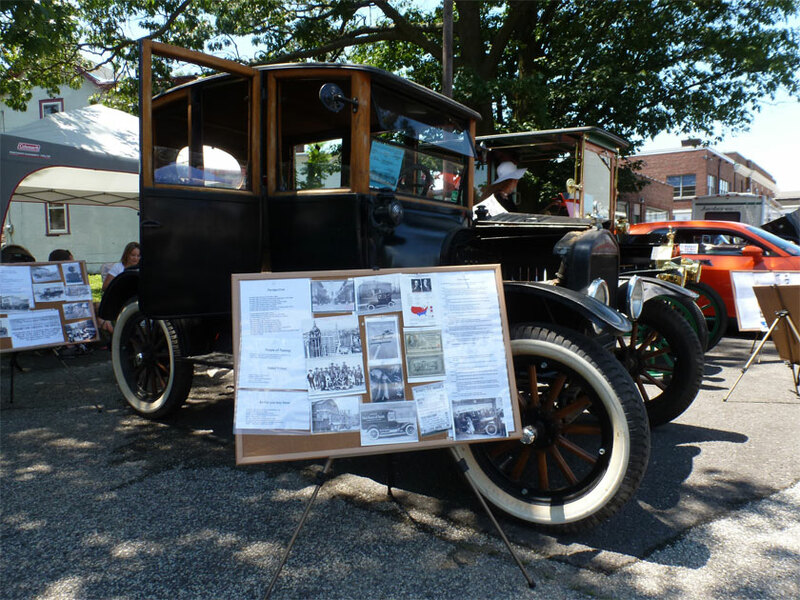 It turned out that there was a nice sampling of Model T Fords at the show. 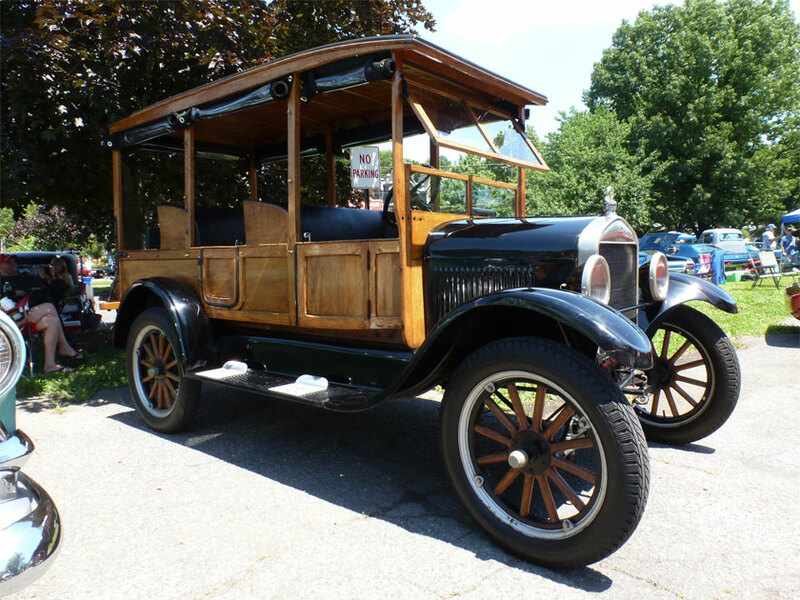 The first Model T I saw was a Model T depot hack. The wooden bodies were made by a variety of companies, or by the buyers themselves. The name comes from their use. Hotels often had these style vehicles for picking up guests at the local train depot. This was a beautiful example. 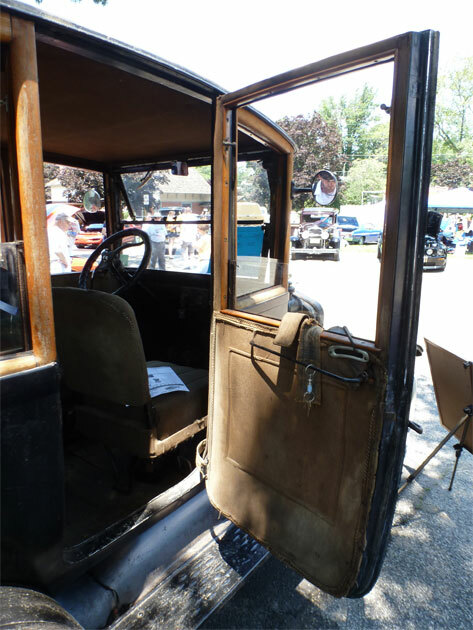 This next Model T is a 1920 centerdoor. 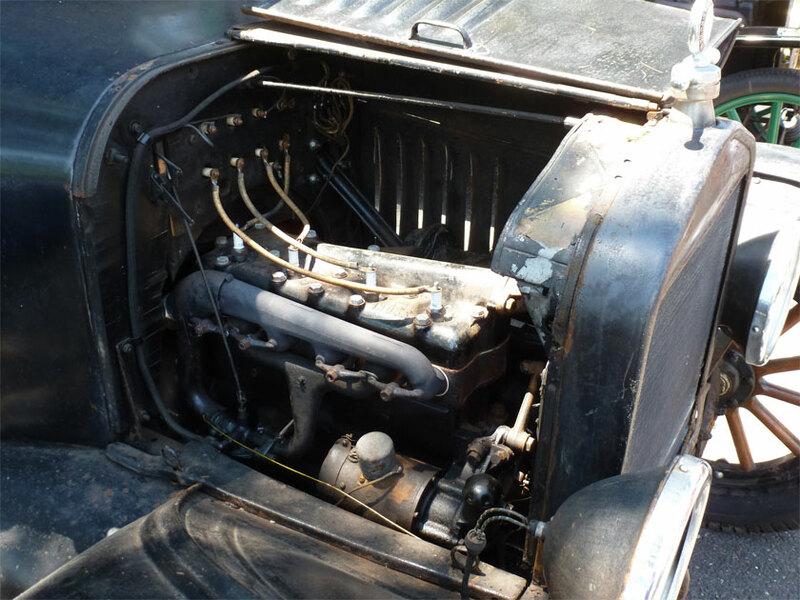 This vehicle was mainly unrestored with small mechanical repairs to make it driveable. Things like new plug wires, tires and such. I love seeing unrestored vehicles. It is like visiting a ghost that has stepped out of time from the barn where it was stored. 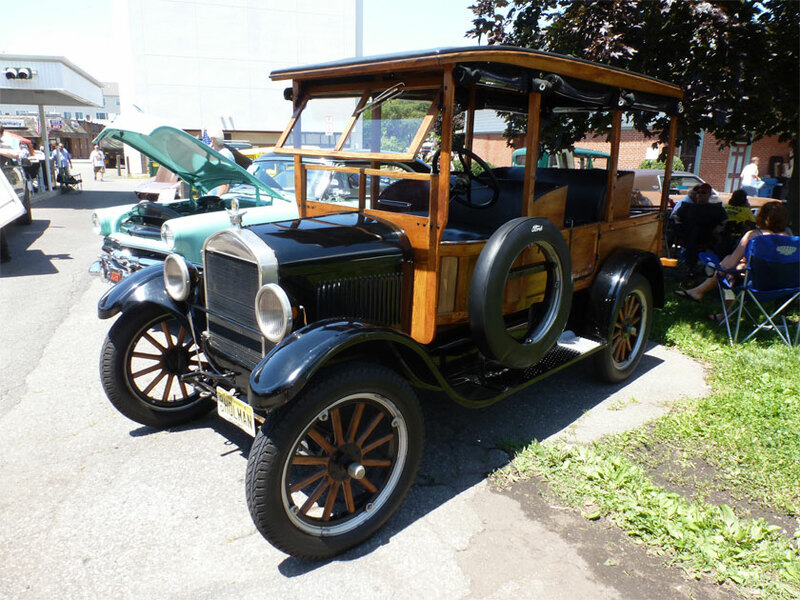 This last Model T dates to 1916. The early T’s had the brass radiator which I believe changed over in 1917. This was a small fire engine belonging to the local Fire Department. 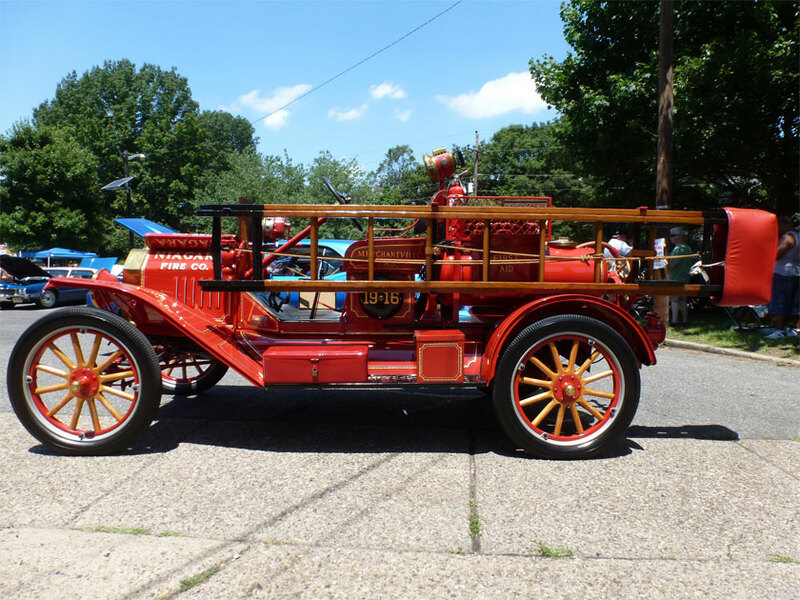 I have seen a wide variety of Model T Fire engines. 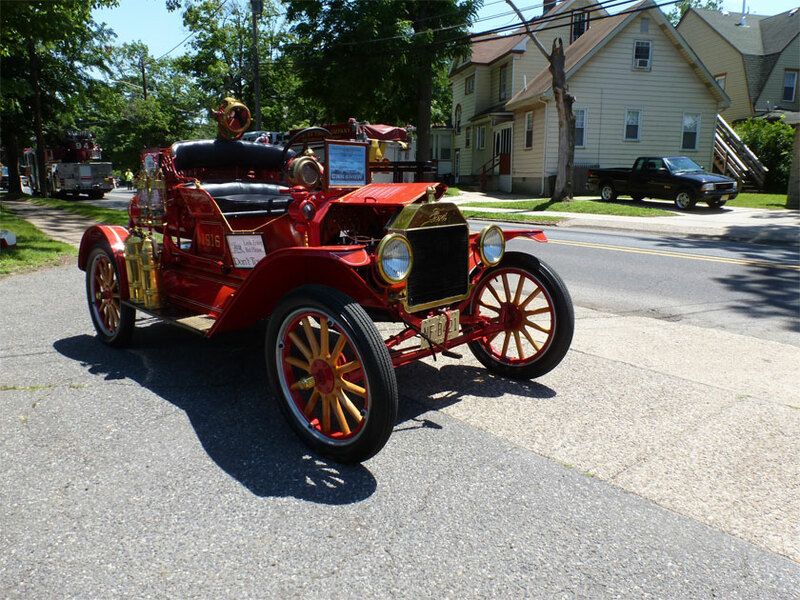 Often they were based on the Model TT which was the larger truck version of the Model T.
With over 15 million Model T’s produced I was happy to see this sampling in Merchantville. More soon! !